Joker Pro slot machine from Net Ent has a pretty classic theme, featuring classic symbols such as 7s, Bar, bells and horseshoes. The game is an excellent mobile title because of its simplicity and that is reflected in its 5 reels, just 10 paylines, and a max jackpot of 1,000x. It does have one bonus round although there are no free spins available. Find out all the details in the full Joker Pro slot review below. For all their innovation, if there’s one thing that software providers NetEnt slots know better than most it’s that sometimes you don’t have to reinvent the wheel to create an incredibly engaging video slot. That certainly appears to have been the case when they were designing the Joker Pro slot, which is essentially a classic five-reel, 10-payline slot machine that has been given a modern graphical makeover. 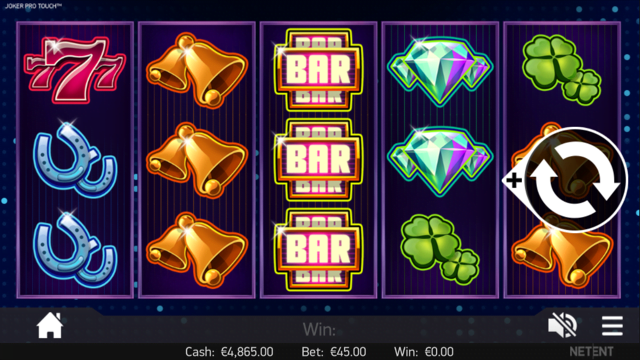 Featuring all of the classic slot staples like bells, BAR logos, diamonds and lucky sevens, the game pays a fitting homage to more traditional titles while also offering a far more modern re-spin bonus feature. Playable from as little as £0.10 per spin across all desktop, mobile and tablet devices, players should be careful not to let the simplicity of the Joker Pro slot machine lull them into a false sense of security – it’s actually a medium-to-high variance game that requires a good run or re-spins if you’re to make a serious profit. As alluded to above, Joker Pro is an incredibly simple slot that adheres to a classic slot machine design – and it is perhaps for this reason that the game only offers players one bonus feature. Fortunately, it is a relatively easy one to trigger, with players simply needing to land one or more joker’s cap scatter symbols on any of the game’s central three reels to earn themselves a free re-spin. During this re-spin, any triggering joker’s cap scatter symbols will remain in place as wilds, with reels one and five also becoming completely wild. Naturally, this improves players’ chances of landing winning payline combos, but they’ll also be granted further re-spins for each subsequent scatter icon. A final incentive is added courtesy of the three central row “hotspots”, with players needing to land a scatter symbol on each of these spaces in order to trigger the game’s top level jackpot of 1,000x their bet. Even if they don’t manage to achieve this, they can usually expect a pretty substantial win from the feature, with stacked symbols on hand to boost their payouts and up to eight re-spins available. Worthy Of The Last Laugh? Although a relatively simple title, the Joker Pro slot still manages to provide plenty of excitement thanks to its easily activated re-spin feature and the added potential of landing big payouts from the hotspot zones. Like the Joker Pro slot review? Check out these as well…..